Former U.S. attorney Jenny Durkan defeated Cary Moon in Tuesday's election and will be sworn in as mayor on Nov. 28, when the results are certified. 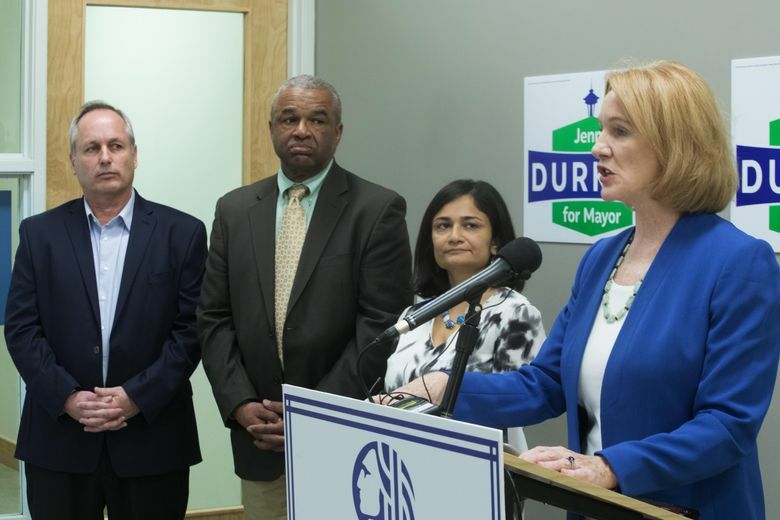 Seattle’s next mayor, Jenny Durkan, named local leaders with expertise in government, transportation and housing Friday to head her transition team. Ron Sims, Shefali Ranganathan and Paul Lambros will serve as the co-chairs of Durkan’s transition committee. The former U.S. attorney defeated Cary Moon in Tuesday’s election and will be sworn in as mayor on Nov. 28, when the results are certified. Sims is a former King County executive and U.S. Department of Housing and Urban Development official. At a news conference in Belltown, Durkan touted Sims’ connections in southeast Seattle. Ranganathan is executive director of the Transportation Choices Coalition, which lobbies for transit, walking and biking infrastructure. Past bosses of the organization include City Councilmember Rob Johnson and former state Rep. Jessyn Farrell, who placed fourth in August’s mayoral primary. Lambros heads Plymouth Housing, which develops and operates supportive-housing complexes for people climbing out of homelessness. Durkan noted Friday that she first met him decades ago when he was part of an LGBTQ community effort to battle AIDS. Durkan said the three leaders will develop ideas on housing, homelessness and transportation for her to act on immediately after taking office. “These appointments show that we have people who have deep roots in this community and varied roots,” she said. Durkan said she intends to announce the rest of her transition team soon, promising a diverse group reflective of her intention to serve “all Seattle,” including voters who backed other candidates. New mayors usually take over at City Hall on Jan. 1, but Durkan will assume office earlier because Ed Murray resigned in September. Tim Burgess, previously a council member, is serving as mayor in the interim.